While the Boss CE-5 Chorus Ensemble Pedal has all the characteristically rich, shimmering tone you’d expect when you hear a number of voices heard in unison, and in tune, with each other the Boss CE5 Chorus Ensemble Pedal gives you finite control over this sound to cultivate your own unique tone with its plethora of controls. Along with the Effect Level & Depth controls the Boss CE 5 Chorus Ensemble Pedal also features a Rate control knob. This control can be adjusted to give you lengthy chorus or thrown the other way to give you a short-cycle modulation effect for the ultimate in warble. 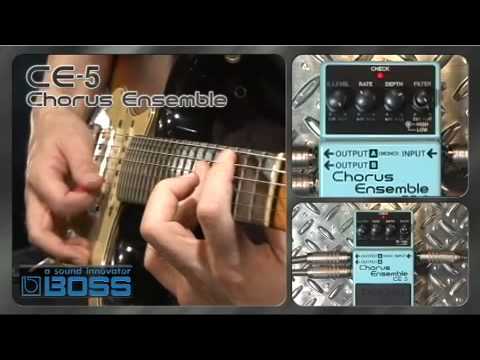 Another control of particular note on the Boss Chorus Ensemble CE-5 Pedal is the Filter. This knob ranges from Cut to Flat to give you full control over the type of chorus you wish to produce. You can go from a mild, natural sound to a much more penetrating, crisper sound at the rotation of a dial. Along with its controls the Boss Chorus Ensemble CE5 Pedal also offers stereo outputs to hook the pedal to dual amps. This extra output gives an extra dimension to your sound to give real depth and atmosphere to your chorus effect. As well as offering all these tone-shaping options the Boss CE-5 Chorus Ensemble Pedal is also ultra-reliable. Although in reality Boss pedals have been known to last decades they offer a 5-year warranty upon registration. This offering is testament to the robust design of the pedal’s aluminium die cast body and sturdy knobs that are built to survive life on the road. Although hardwearing the pedal is surprisingly lightweight and compact, making it the ultimate travel companion.